BRADLEY CRAIG, LMSW-IPR, CFLE received his Master's Degree in Social Work at UTA and is a Licensed Social Worker and Certified Family Life Educator. He is a noted co-parent educator in the North Texas area, and has developed a number of parent education programs for families raising children in two homes. He also served as an Adjunct Professor at the University of Texas in Arlington. He began specializing in working with families raising children between two homes in 1993 when he was hired by Tarrant County to conduct social study investigations and provide mediation sessions. He helped them design an orientation for litigating families offered by the county. In 1998, he developed the Children in the Middle Coparenting Education class. Brad left the County in 1999 to open up a program called Children in the Middle Coparenting Services, Inc., a comprehensive agency designed to help adults raise children between two homes. In addition, he began offering consultation sessions where he would meet with couples and their significant others to develop a shared parenting plan. Children in the Middle Co-parenting Services, Inc. was closed in December of 2003 when Brad was hired to develop and maintain a coparenting program with a social service organization. He is currently in private practice through Between Two Homes® LLC and contracts with organizations to provide services to families. As a social worker and family life educator, Brad is a trained family law mediator and provides family law mediation training currently with other organizations. In addition, he offers training for other professionals to structure approaches to help these children being raised between two homes. He works with divorcing families and those with continuing custody/parenting time issue as a Family Mediator, Collaborative Law Allied Professional, Co-parenting Case Manager, Co-parenting Coach, Educator, Parenting Facilitator, and Parenting Coordinator. Along with Aaron Robb, Ph.D., Brad has trained many parenting facilitators in Texas through their parenting facilitation training program. He has also copresented with Ann Marie Termini, coauthor of "The Psychotherapist As Parent Coordinator in High-Conflict Divorce: Strategies and Techniques." 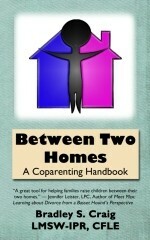 Brad is the author of Between Two Homes series of books and has written curriculum for coparent education programs and has developed educational videos. He has been a guest speaker on many television and radio programs and is often asked to speak at local, state and national conferences on co-parenting issues. He hosted an ongoing cable television series "The Children in the Middle Show," aimed at educating viewers about both the effects of parental conflict after a separation on children and the services available to help families through co-parenting issues. Brad provides professional seminars on coparenting issuess, high conflict families, tools in working with families raising children between two homes, parenting coordination, and forensic vs. therapeutic best practices to organizations and professionals by request. Mr. Craig is approved to offer Continuing Education programs for Licensed Professional Counselors, Licensed Marriage and Family Therapists, and Social Workers. Mr. Craig provides professional seminars on coparenting issuess, high conflict families, tools in working with families raising children between two homes, parenting coordination, and forensic vs. therapeutic best practices to organizations and professionals by request. For more information, please click here.